YEKATERINBURG, May 18. /TASS/. 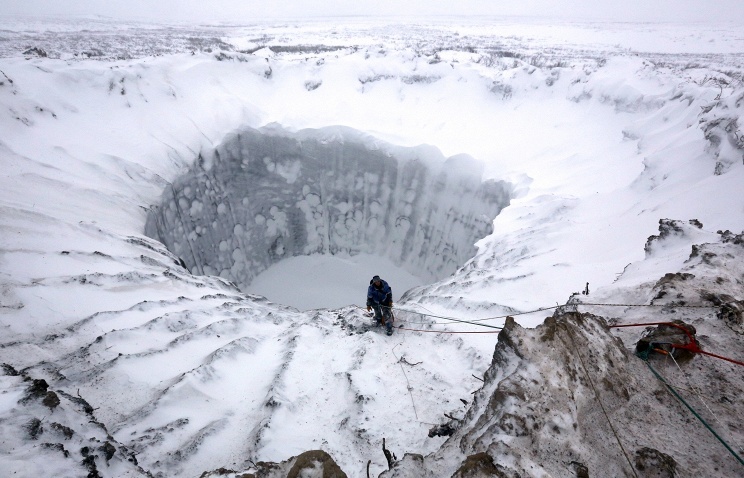 Russian scientists will carry out complex research this summer to explore a giant hole in permafrost discovered last year on the Yamal peninsula of northwest Siberia, Arctic Exploration Centre head Vladimir Pushkarev said on Monday. "Several groups of scientists are planning a series of expeditions to the huge Yamal hole," Pushkarev told TASS, adding that the missions would take place in July, August and September. Most samples taken from the bottom of the hole last year have already been studied. "The version that the hole has a natural origin is currently a priority," Pushkarev said. The opening, some 60 metres in diametre and at least 200 metres deep, was first spotted by helicopter pilots in July 2014, close to the Bovanenkovo oil field. Explanations of the crater's origin range from meteorites to aliens. But Academician Valery Melnikov told TASS in November that the hole appeared due to climate change and subsequent release of sub-surface gas trapped in the permafrost. from the flight axis. This gives the multiple gas trails which blend into a single halo. This is clearly a man made object. I guess Uncle Sam is not the only one working on prompt global strike devices. British physicist Stephen Hawking and Russian entrepreneur Yuri Milner announced a $100 million 10-year quest to find extraterrestrial life. Astrophysicist Stephen Hawking and Russian entrepreneur Yuri Milner announced a new $100 million initiative to search for extraterrestrial life. In a live webcast from London, the physicist and the entrepreneur announced their initiative to build the "Breakthrough Listen" initiative which will work with two radiotelescopes, one in Australia and one in the US, to analyze data and offer a $1 million prize for anyone who is able to find evidence of extraterrestrials. "There is no bigger question. It's time to commit to finding the answer to search for life beyond earth. The Breakthrough Initiatives are making that commitment. We are life, we are intelligent, we must know," Hawking said. Milner is committing $100 million to the project, which would be as much as 100 times more powerful than previous attempts, such as the academic SETI (Search for Extraterrestrial Intelligence) project, according to SETI's director. A tech entrepreneur and a physicist by education, Milner invests in tech ventures in Russia and around the world. "In the 21st century we will find out about life at a galactic scale," Milner said. "To understand the universe, you must know about atoms, about the forces that bind them, the contours of space and time, the birth and death of stars, the dance of galaxies, the secrets of black holes, but that is not enough," Hawking said. Hawking added that the search must answer what he calls the biggest question, the existence of intelligent extraterrestrial life. "This idea cannot explain everything. It can explain the light of stars, but not the lights that fly from Planet Earth. To understand this light, you must know about life, about minds. We believe that life arose spontaneously on earth, so in an infinite universe there must be other occurrences of life. Somewhere in the cosmos, perhaps, intelligent life might be watching these lights of ours, wondering what they mean. Or do our lights wonder the lifeless cosmos?" Hawking added. I wonder if this is just a big sinkhole, from oil field drilling> We have some big sinkholes in Texas from drilling. crater you could see a ring of debris which was ejected from the interior. I heard they were methane eruptions, and also that while plenty planned to go and explore them they are now filled with water... which will make exploration much more difficult. GarryB wrote: I heard they were methane eruptions, and also that while plenty planned to go and explore them they are now filled with water... which will make exploration much more difficult. Dissociating clathrates (methane hydrates) release a huge amount of methane. produce a rather huge explosion. But there is enough CH4 pressure to produce these holes without detonation. That is a shtload of methane... and methane is 20 times more potent a greenhouse gas than CO2... it degrades over time in the atmosphere... into CO2. A Russian helicopter pilot who went missing during the Iqaluit-to-Greenland portion of a trip around the world was down to his last flare when he was found on a floe in the Davis Strait this morning. Sergey Ananov, who left Moscow in mid-June, was travelling to Greenland in a Robinson R-22 helicopter after fuelling up in Iqaluit when the Canadian Forces Joint Rescue Co-ordination Centre received information about a missing helicopter Saturday morning. "It couldn't have been a more austere area of the planet to be in the Davis Strait between Baffin Island and Greenland. It's a pretty rough terrain, a lot of ice in it," said Rear Admiral John Newton. Bad decision to buy Robinson helicopters, they are among the least reliable and among most prone to malfunctions and crashes. Werewolf wrote: Bad decision to buy Robinson helicopters, they are among the least reliable and among most prone to malfunctions and crashes. Every time there is a helicopter crash, it "involves" a Robinson unless proven otherwise. The among two highest crash rates are among Robinson R-22/44 or AS350 Eurocopter. Robbinson have a very high tendency for mast bumping which is a bad designed helicopter to reduce the costs for this civilian purposed helicopter for private customers with low budgets. similiar bad designs we could see on old UH-1 and AH-1 with the very lose rotorhead which were prone for mast bumping, several occassians were mast bumping would be so severe that rotors would snap into tail or cockpit. AH-1Z has a very good rotor arrangement and has increased not only survivability and safety but also performance and maximized limits of how the it can behave in hard pullings. Researchers have found what is believed to be the youngest lake on Mars, challenging our previous knowledge of the Red Planet, and presenting the best place yet to search for ancient alien life. As NASA considers the possibility of a manned mission to the Mars, it may, first, send another lifeform: microscopic bacteria which could biologically engineer the planet’s ecosystem, making it more habitable. It’s a long held belief by scientists that despite its barren surface today, Mars used to be submerged under vast oceans billions of years ago. Then, at what scientists estimate to be 3.7 to 3.8 billion years ago, the planet’s atmosphere was swept up into space, taking with it all the remaining bodies of liquid water. But a new research study published in the journal Geology uncovered a basin that may have housed a body of water 36 million years ago — a full 200 million years after scientists believe Mars had seen its last drop of liquid water. Since water is the basic ingredient for life, the new finding not only challenges previously held assumptions about the Red Planet, but also provides a new basis to search for evidence of life. The findings came from a study of salt deposits in an 18-square-mile area near the Martian equator, about 100 miles from NASA’s Opportunity rover landing site. “Just like on Earth, when salts are left somewhere, that probable means that water was there,” Brian Hynek, lead author of the study, told the Business Insider. "So these are indicators that water was there in some form." In order to figure out how long ago the body of water had been there, and how much of it was there, the researchers had to investigate the age and origin of the salt deposits next. To do so, they had to count the number of impact craters and measure their size across the region. With images taken by NASA’s Mars Reconnaissance Orbiter, which has been orbiting the planet since 2006, the research team used digital terrain mapping and mineralogical analysis of the areas surrounding the basin to determine its age. The evidence presented in the analysis suggested that the lake flowing through the basin grew large enough to overflow it, and eventually created channels. As they traced these channels, the team found that they flowed over volcanic plains estimated to be 3.6 billion years old, thus indicating that the lakes themselves must be younger. "Having a later stage of water on Mars is probably a good thing for the potential for life on that planet because it gave life more time to be conceived," Hykes noted, explaining the significance of their findings. "There was life on Earth when this lake was active so by that analogy, we can say there’s potential that Mars had microbial life and this was a great place where it could have resided." More importantly, the scientists hope that these latest findings will make the basin a prospective touchdown site for the NASA Mars rover that is slated to launch in 2020. Hynek believes that the site’s existence raises several key questions that could potentially shape the future search for ancient Martian life. "That is the million dollar question. Did Mars ever have life?" he said. "If it did, was it like Earth’s life or was it some totally different life form? At least, all life on Earth needs water. This is one of the key requirements and here is a place fairly late-stage in Mars’ history where there was water around." 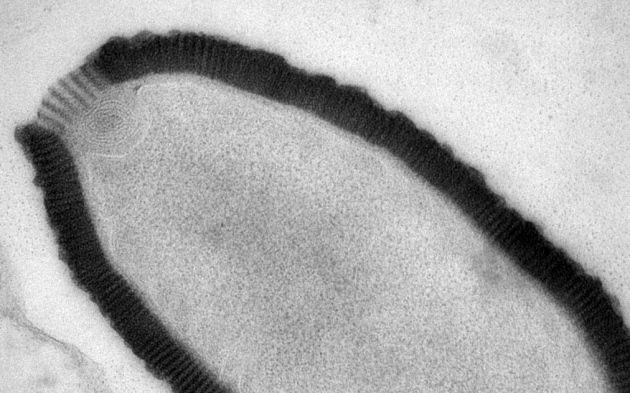 Largest virus yet discovered hints at viral diversity trapped in permafrost. "new" viral species from the permafrost. Dear god. Did it spread too far? Wilfred Brimley was right in what he was supposed to do. by humans via yearly infections that is bad news. Some flu species trapped in the ice could bring a disaster. There's already infectious diseases killing millions of people a year, a lot of them easily preventable...just like millions of starvation deaths a year, but so long as their mostly contained in the non-Western world, you won't actually see in any real progress. The West prefers to make an entity like USAID into a regime change operation, instead of actually being used for it's intended purpose. But most of these deaths are not due to the virulence of the disease. Scientists have discovered a huge underground waterbody in China’s northwest Xinjiang province, Discovery website reported. The giant water reservoir was discovered in the Tarim Basin. The basin located in China’s northwestern Xinjiang province, which covers about 350,000 square miles, is one of the driest places in China. The area of the water reservoir is roughly the size of Egypt. The scientists actually made the discovery while investigating carbon dioxide absorption by the region. According to Professor Li Yan of the Xinjiang Institute of Ecology and Geography, the water in the underground reservoir could be much more than scientists estimate. The water itself is too salty therefore it cannot be used in households. “A 2014 study in Nature Climate Change, which found that the Mojave Desert acts as a carbon sink, suggested that the world’s deserts might play a role similar to oceans and forests in soaking up and storing some of the excess carbon emissions from human activity,” Discovery reported.